Emergency preparedness (EP) can be described as a continuous cycle of planning, organizing, training, equipping, exercising, evaluating, and taking corrective action in an effort to ensure effective coordination during incident response. Louisiana, in close proximity to the Gulf of Mexico, has its fair share of hurricanes and weather-related emergencies. Like other parts of the country, Louisiana must also remain vigilant by preparing for disease outbreaks, bio-hazards, terrorism, technological failure, and other emergencies. According to the Trust for America's Health, Louisiana recently scored a 6 out of 10 in key indicators of public health preparedness. In many cases, Community Health Centers play an enormously significant role in emergency response. Identifying the appropriate roles for health centers in an emergency can be a challenge because of variations in their size and scope, inherent capabilities, and in the relationships they have with local hospitals and other response partners. However, with the right type of planning, which includes carving out specific emergency management roles based on community needs, health centers are uniquely poised to assist those individuals who are disproportionately affected by disasters. 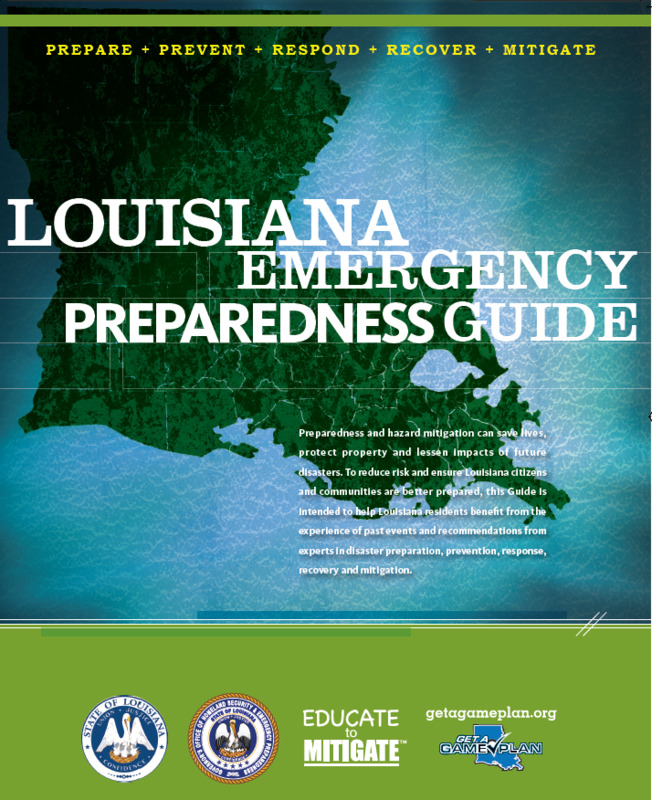 LPCA’s Emergency Preparedness initiative aims to act as a resource for Louisiana’s FQHCs as they seek emergency management guidance, information on trainings, literature, and resources to assist in the development of an effective EP framework for centers, staff members, patients, and the broader community. Mitigation: Ensure that your FQHC has a plan to prevent an accident before it occurs. Prevention: Create an EP plan that allows flexibility for an all hazard event so that the plan framework will not vary from emergency to emergency. Preparedness: Ensure that your staff and administration are trained and understand what to do in the event of an emergency - remember to practice, practice, practice! Response: Have the proper response ready to get your center back up and running in a timely manner. Recovery: Evaluate and improve the plan by including things that could have been done differently. Plan ahead for an emergency/disaster. Surveillance of unusual occurrences in the workplace/surrounding area. Staff, administration, community and patient education. Understand and recognize responsibilities in the community as a CHC during an emergency. Understand the FQHC roles on all levels in the event of an emergency. Prepare and stockpile equipment and other general necessities in the event of an emergency or disaster. Make a plan for back up necessities stockpile necessary supplies for your facility. Consider having an evacuation plan in the event that you have to leave the area. Have a backup communication system. Have a safe location to evacuate to in the event that a warning of the emergency is not given. Have a way that the patients can contact the clinic staff to receive more information. Have a plan to reopen your health center after the emergency/disaster. Have an emergency financial plan. Follow the response per local emergency management officials. Plan to secure facility in the event of an evacuation evacuate. Prepare a separate safe location to move staff and patients to. Have backup supplies that may exceed the daily needs. Have the proper emergency necessities needed to protect patients and staff from the agent. Establish a plan to move to a safe location. Get connected with local emergency management and response officials. Protect patients and staff from spreading germs by using the proper cleaning techniques. The CDC works to protect America from health, safety, and security threats, both foreign and domestic. Whether diseases start at home or aborad, are chronic or acute, curable or preventable, human error or deliberate attack, the CDC fights disease and supports communities and citizens to do the same. FEMA's mission is to support US citizens and first responders to ensure that as a nation we work together to build, sustain, and improve our capability to prepare for, protect against, respond to, recover from, and mitigate all hazards. LDH's Office of Public Health works to protect and promote the health and wellness of all individuals and communities in Louisiana. This is accomplished through education, promotion of healthy lifestyles, preventing disease and injury, enforcing regulations that protect the environment, sharing vital information, and assuring preventive services to uninsured and underserved individuals and families. Questions about emergency preparedness? Please contact Dara Stout at dstout@lpca.net or (225) 927-7662, ext. 202.